THIS CLASS IS NOW FULL! Hit refresh in your drawing! 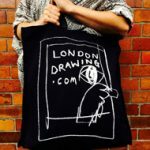 Join London Drawing tutor and artist Frank Gambino for a brand new workshop designed to encourage you to explore physicality in your drawing. This is a really exciting class- using physical, dynamic models and sound to help you get in touch with your dynamic side to use your body in your drawing- all using simple materials and approaches. Frank Gambino is a very physical artist, who has lots to offer with regard to creating confidence and strength in your drawing. As with all our workshops- expect practical demonstrations, lots of helpful tips and one to one tuition.